Mary Quant once remarked that "Vidal Sassoon was the first hairdresser to cut hair as though it were a material." She recognised that his cutting hair was something deeply creative, and his hairstyle was nothing but artwork in motion. It's a very sharp observation befitting the founding father of modern haircutting. Cutting fabrics is not my forte, but, I always wish I could design clothes that are very unique and original. I have a client who runs a company called Twisted Printz. The link is here. She told me that I can easily create T-shirts using my own drawings, photos or any images printed on them. That really got me interested. I often joked about making the T-shirt with "Hiro cuts my hair" on it for my clients to wear. I thought, although I can't design it from scratch, I can still create something that is the one and only. So, I decided to have a go. And, here it is. 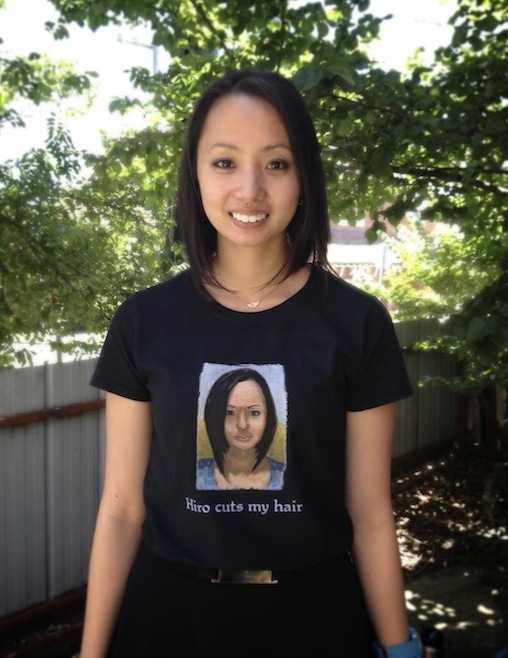 Kate from Zucci Hairdressing in Ivanhoe, wearing T-shirt that has her portrait (painted by me) printed on it.